The social Nokia Lumia 800 features colors (cyan, magenta and black) and the best social and Internet performance, with one-touch social network access, grouping of contacts, integrated communication threads and Internet Explorer 9. It features a 3.7 inch AMOLED ClearBlack curved display blending seamlessly into the reduced body design, and a 1.4 GHz processor with hardware acceleration and a graphics processor. 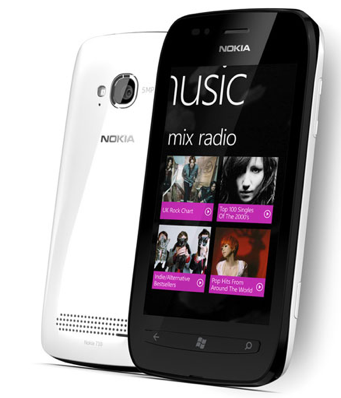 The Nokia Lumia 800 contains an instant-share camera experience based on leading Carl Zeiss optics, HD video playback, 16GB of internal user memory and25GB of free SkyDrive storage for storing images and music. The estimated retail price for the Nokia Lumia 800 will be approximately 420 EUR, excluding taxes and subsidies. 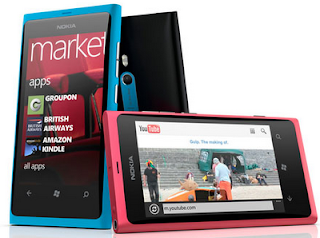 The cheaper Nokia Lumia 710 can be personalized with exchangeable back covers and thousands of apps. The Nokia Lumia 710 is designed for instant social & image sharing, and a browsing experience with IE9. It is available in black and white with black, white, cyan, fuchsia and yellow back covers. With the same 1.4 GHz processor, hardware acceleration and graphics processor as the Nokia Lumia 800, the Nokia Lumia 710 delivers high performance at an affordable price. The estimated retail price for the Nokia Lumia 710 will be approximately 270 EUR, excluding taxes and subsidies. Both phones include Nokia Drive, which delivers a full-fledged personal navigation device (PND) with free, turn-by-turn navigation and dedicated in-car-user-interface; and Nokia Music introducing MixRadio, a free, global, mobile music-streaming application that delivers hundreds of channels of locally-relevant music. Not available in the US until "early" 2012 hmm.